Piedmont Technical College recognized more than 300 students who received certificates, diplomas and associate degrees during spring commencement exercises May 9 at the James Medford Family Event Center. Building construction technology graduate Tara Lindley of Clinton proudly displays her degree. 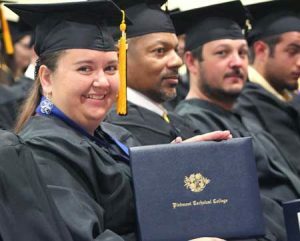 The James Medford Family Event Center at Piedmont Technical College was the setting for the culmination of many dreams for the more than 300 Piedmont Technical College graduates who took center stage in two commencement ceremonies. Brooks was followed by the commencement speaker Michael Nix, Chief Operating Officer, Chief Financial Officer and Managing Director at Greenwood Capital Associates. The winners by their counties of residence and their majors were: Abbeville: Bobby Suit, Associate in Science; and Sheila Weitkamp, veterinary technology; Edgefield: Mary Adams, administrative office technology; Greenwood: Theodore Thomas, commercial art; and Brian Clark, industrial electronics technology and mechatronics; Laurens: Julia Hale, electronic engineering technology; McCormick: Grant Willis, mechanical engineering technology; Newberry: Bonnie Alger, computer technology; David Castro, criminal justice; and Corey Cook, criminal justice; and Saluda: Suzanne Bird, administrative office technology. Presenting this year’s graduates was Andy Omundson, dean of student services. Certificates, diplomas and associate degrees were conferred by Brooks and Susan Timmons, vice president for educational affairs, with assistance from board chairman William Whitfield; Evelyn Beck, dean of Arts and Sciences; Jerry Alewine, dean of health science; Tara Harris, dean of nursing; Sissy Copeland, dean of business, information technologies and public service; and Rusty Denning, interim dean of engineering and industrial technologies. The macebearer was Bradley Griggs, faculty senate president. The mace was designed by members of the faculty and staff and presented to the college in 1991 by PTC’s Alumni Association. Music was provided by Emerald City Brass. Rev. Krystal Bryant, pastor at St. Paul AME Church in Hodges, delivered the invocation and benediction. EDGEFIELD – Mavis J. Culbreath, associate in applied science, major in general technology, medical assisting concentration. JOHNSTON – Ora D. Bryant, associate in applied science, major in administrative office technology, medical concentration; and Wallace F. Middleton, associate in applied science, major in criminal justice. TRENTON – **Mary Y. Adams, associate in applied science, major in administrative office technology, accounting concentration.